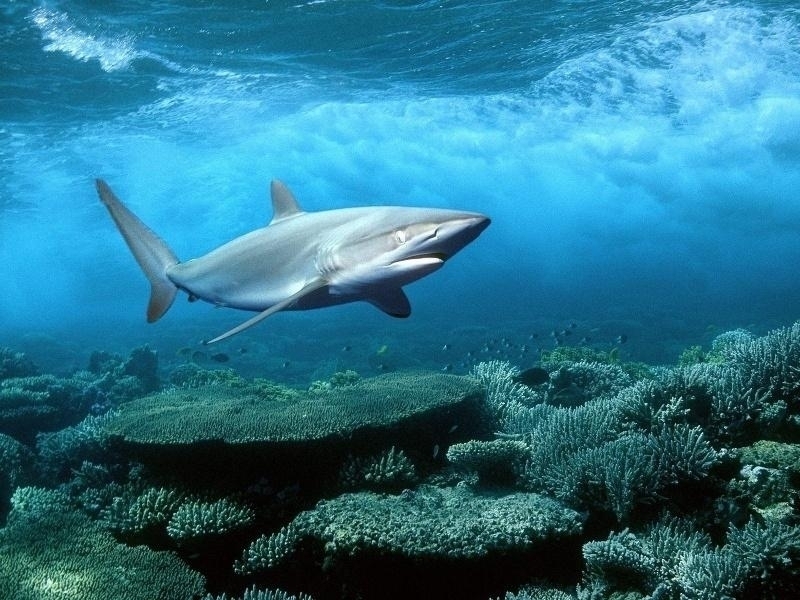 Silky Sharks measure up to 3.5 meters in length with a maximum published weight of 346 kilograms. 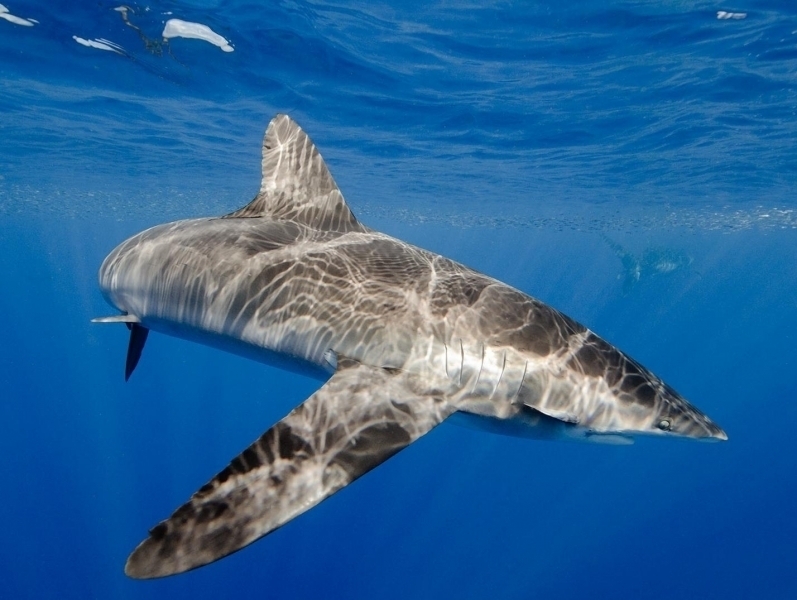 This species has a lifespan of about 23 years. 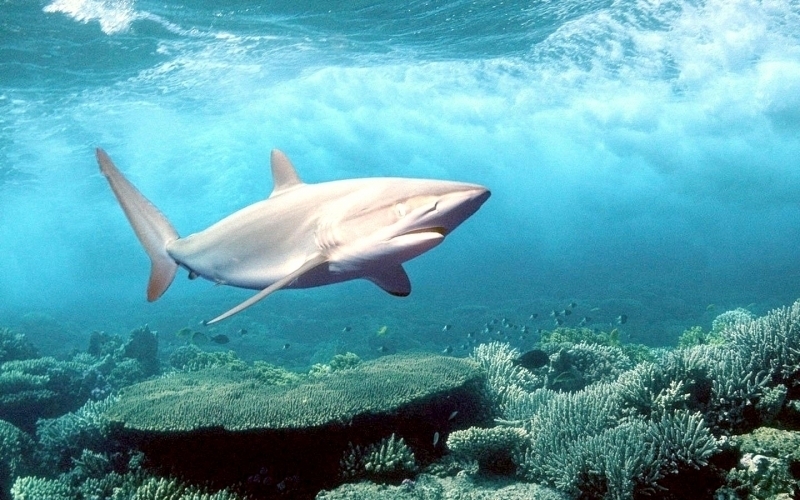 Silkies are large but slender sharks with long, flat snouts, large eyes and small serrated teeth. 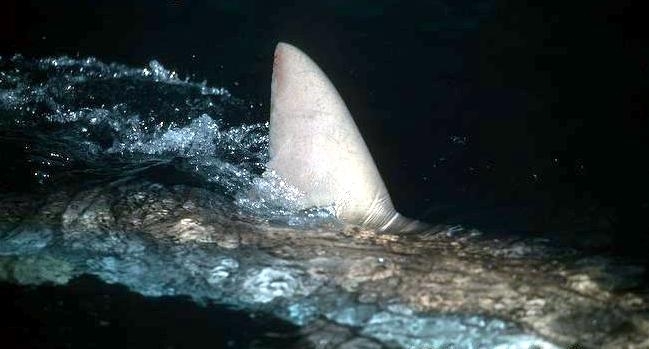 Their second dorsal fin is low on their body and has a long rear tip. 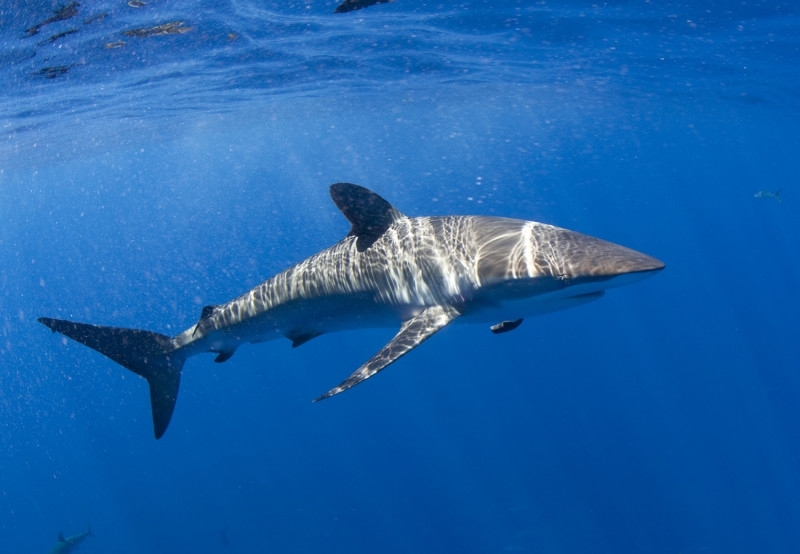 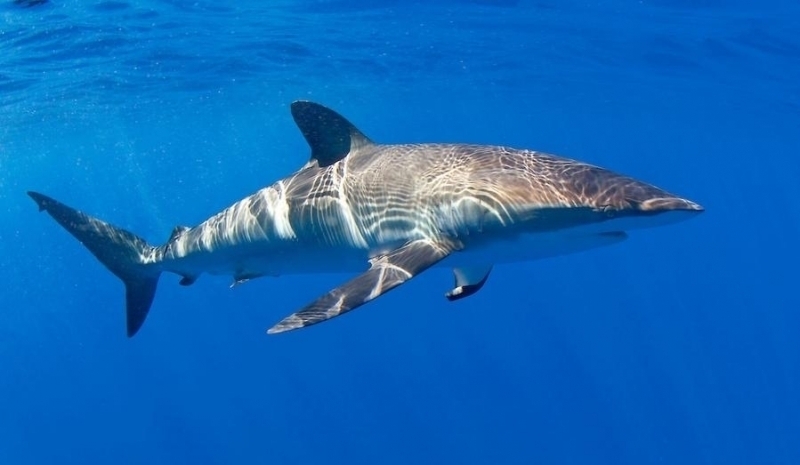 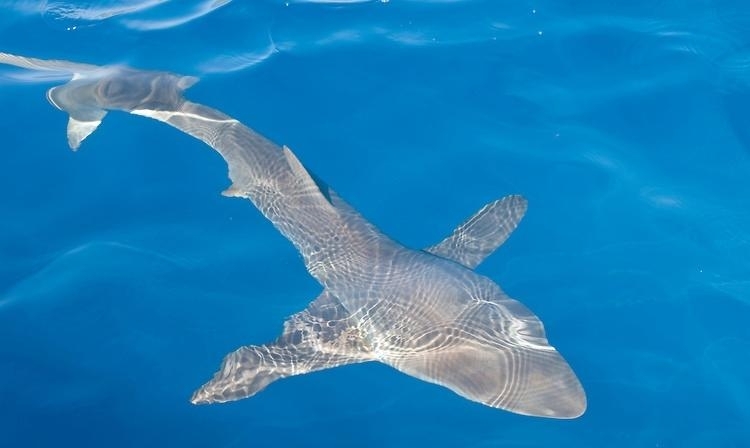 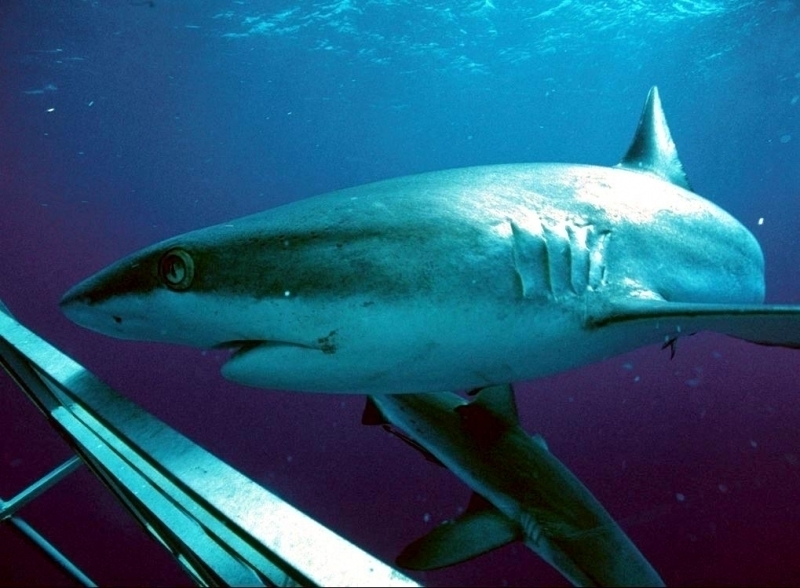 Silky Sharks are gray to blue-gray on their dorsal (top) side, white on their ventral side (under). 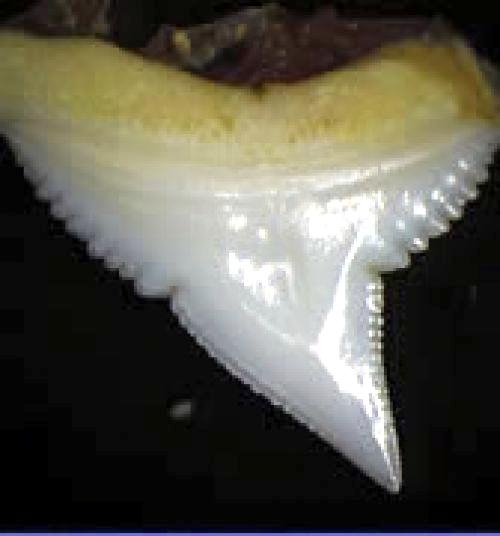 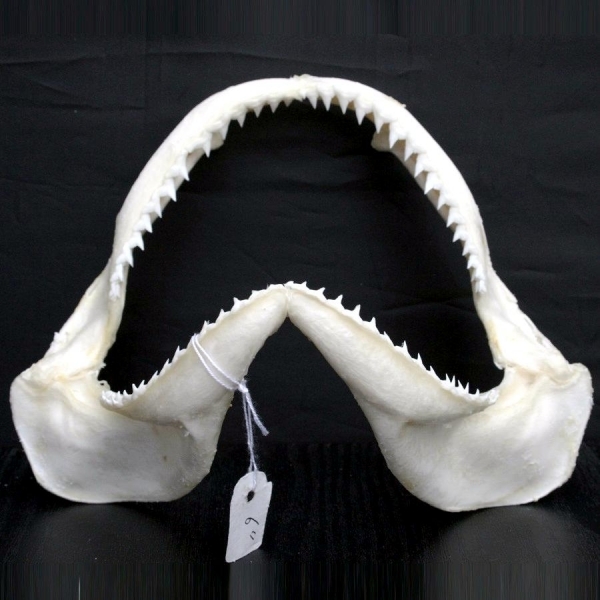 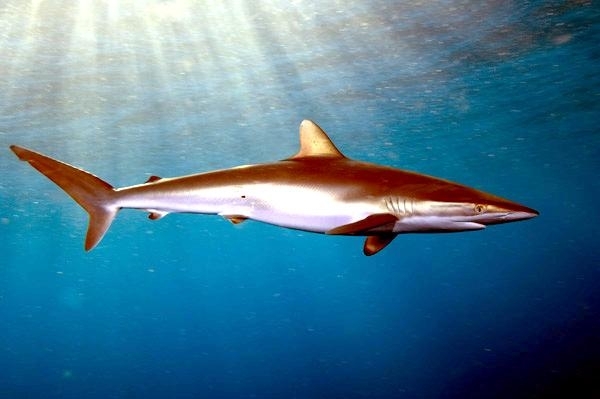 They get their name because their “silky smooth” hide, the result of its densely-packed dermal denticles and are also called “net-eater sharks” in the eastern Pacific because of their tendency to ravage Tuna seine nets. 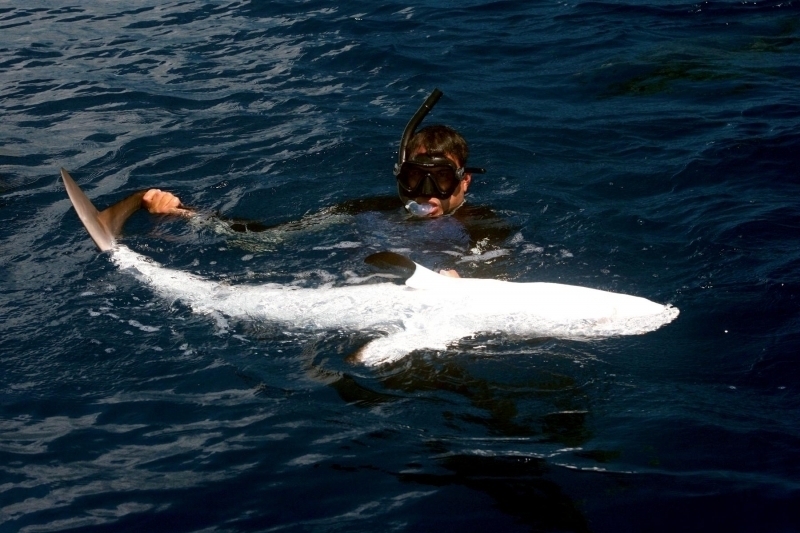 Silkies are quick, aggressive and solitary and often found near schools of tuna. 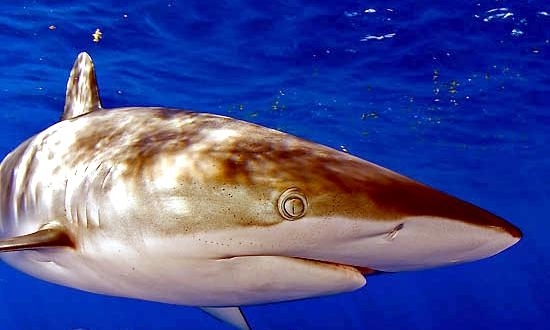 Silky Sharks are a highly migratory species found in subtropical waters between 40°N-40°S in the western Atlantic from Massachusetts, south to southern Brazil, in the Gulf of Mexico and the Caribbean Sea. 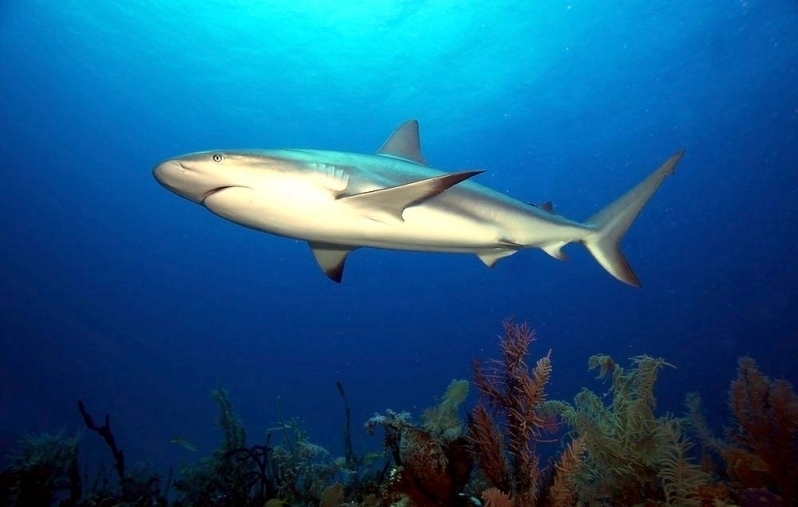 In the eastern Atlantic, Silky Sharks are found near Spain, northern Angola and Cape Verde. 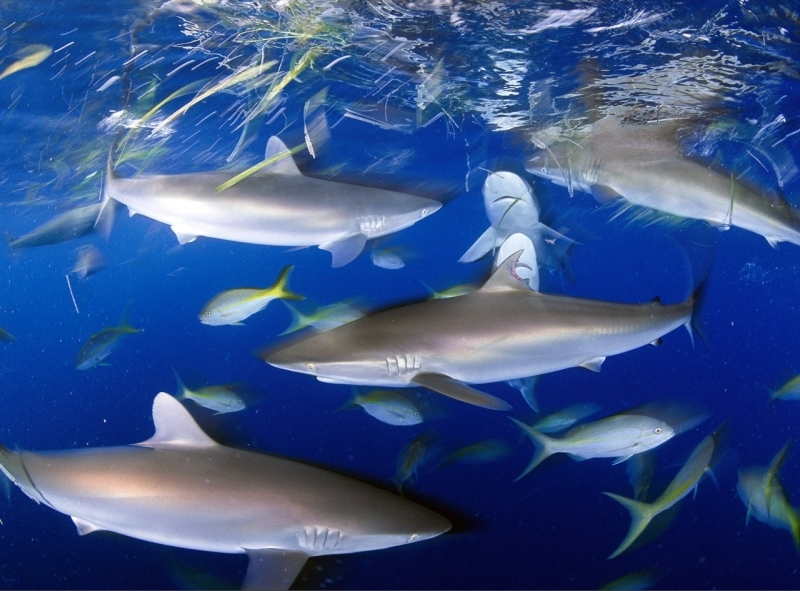 In the Indo-Pacific there are a few records from the Red Sea and Natal, South Africa, China, New Zealand and in the Hawaiian, Phoenix and Line Islands. 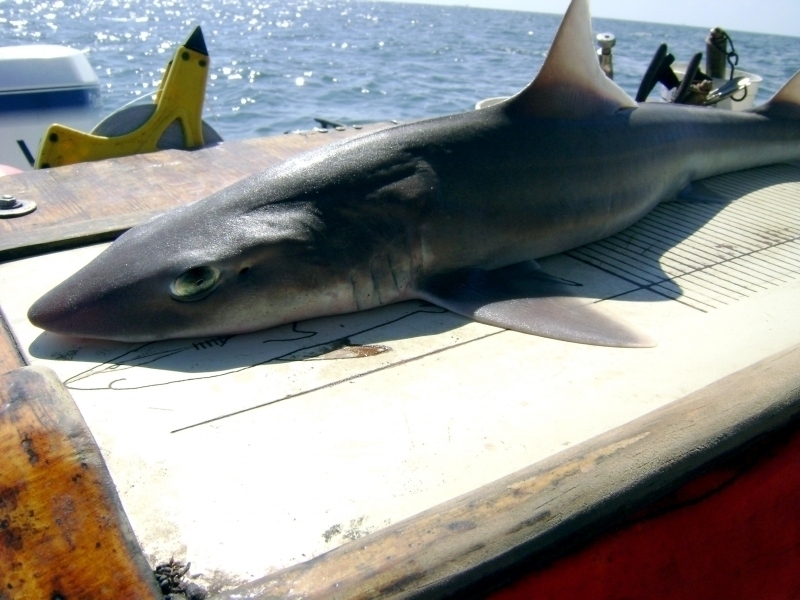 In the eastern Pacific, the Silky is found near southern Baja California, Mexico and northern Chile. 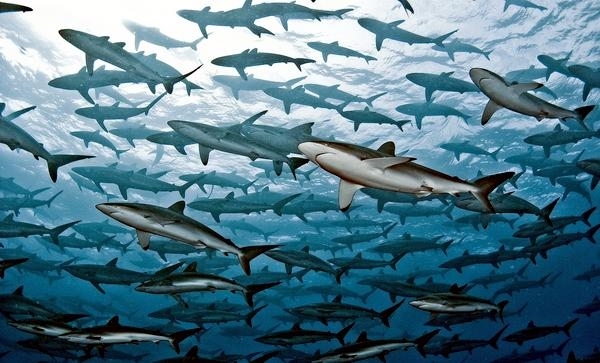 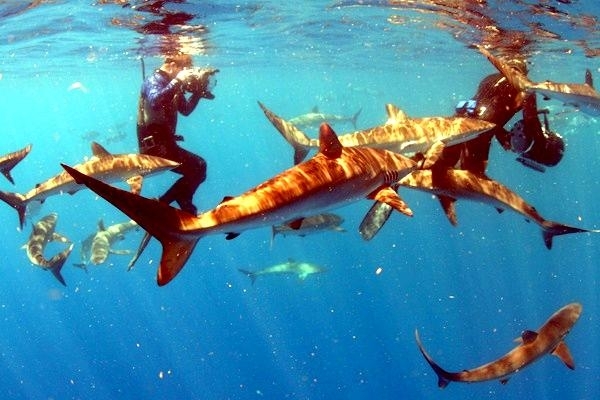 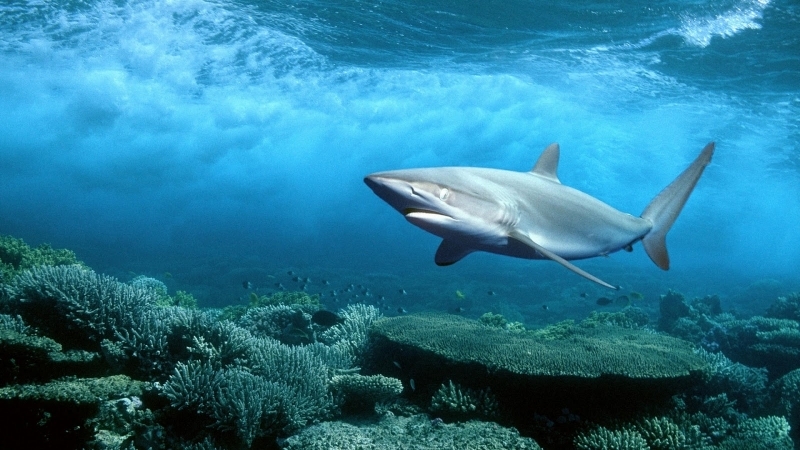 Silky Sharks inhabit the continental and insular (island) shelves and slopes, deep water reefs and the open sea. 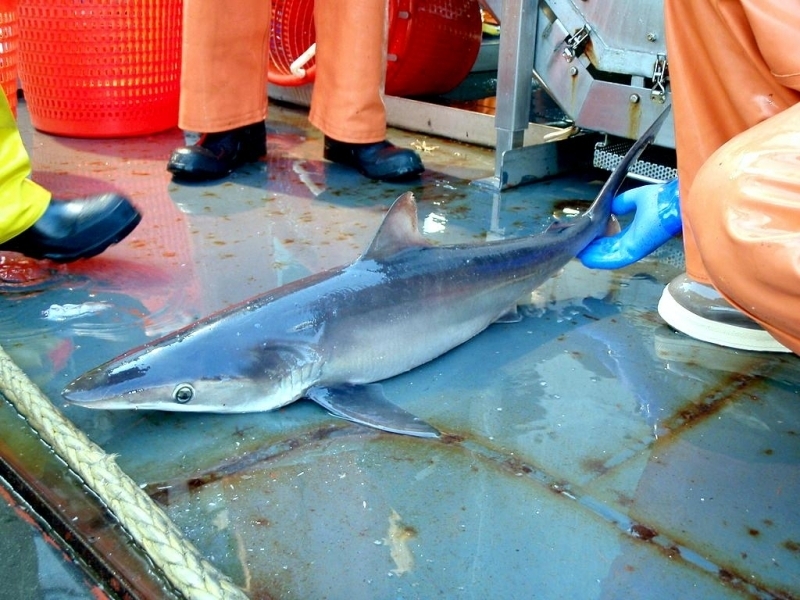 They are also occasionally sighted in inshore waters. 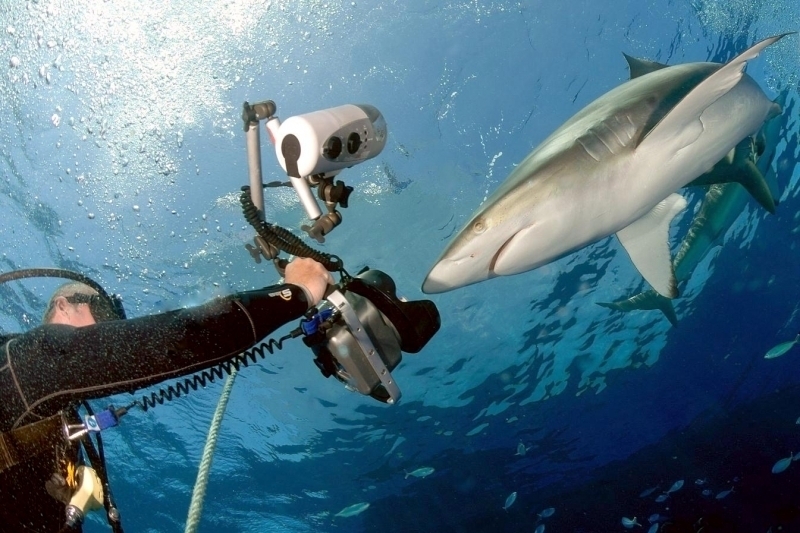 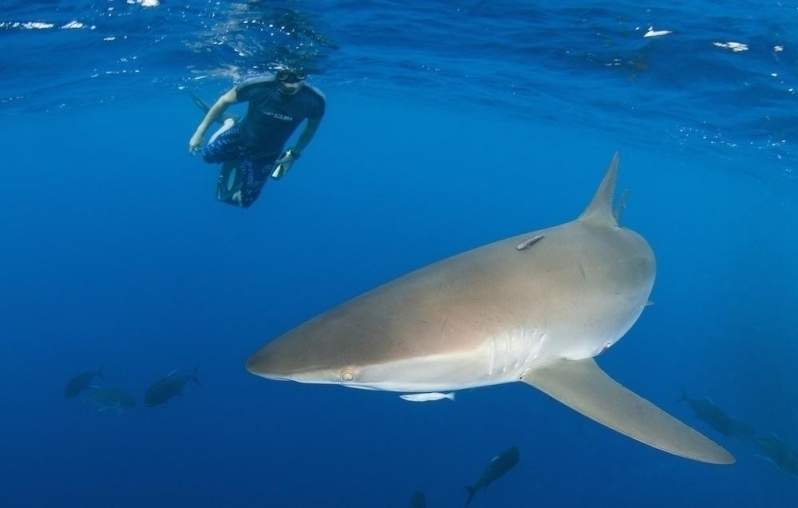 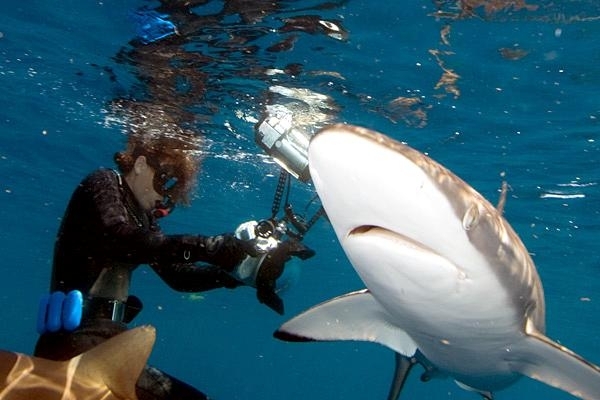 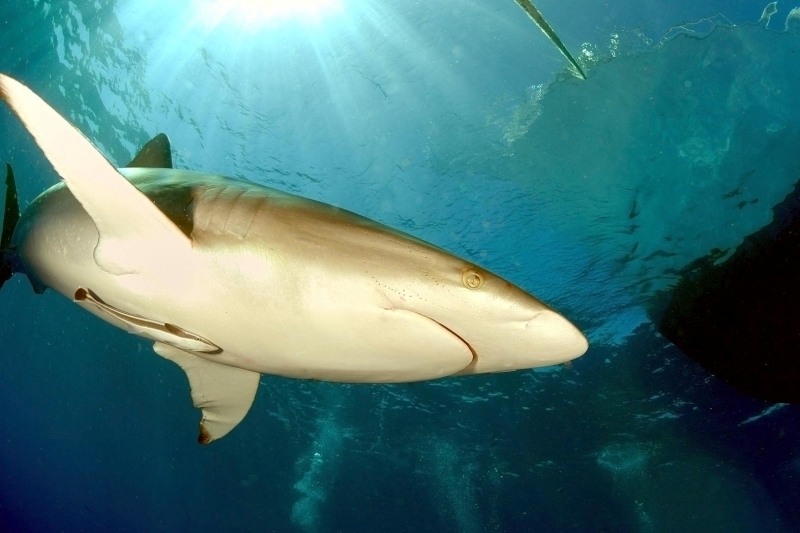 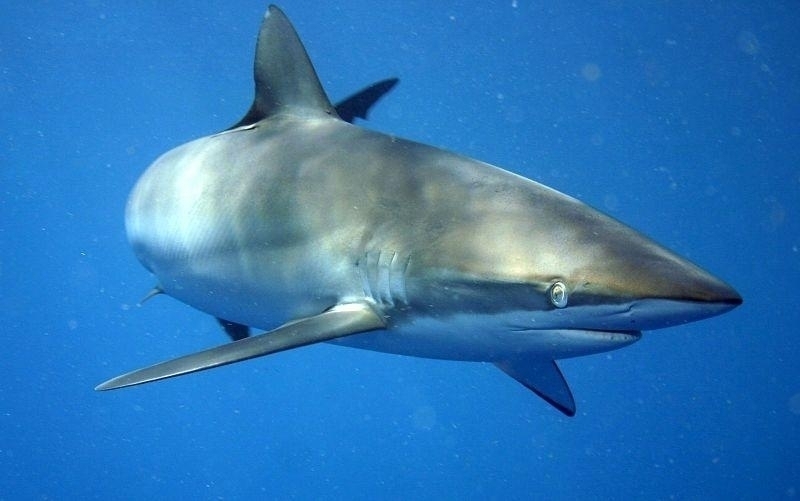 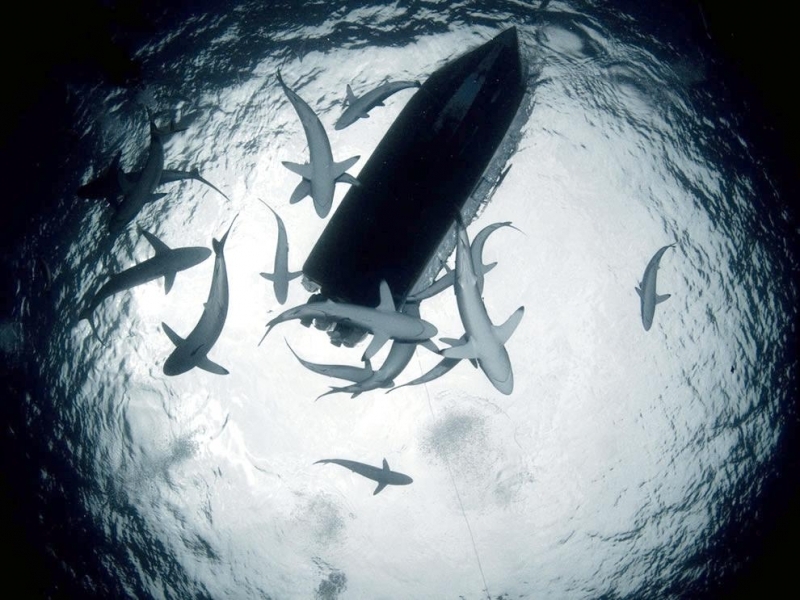 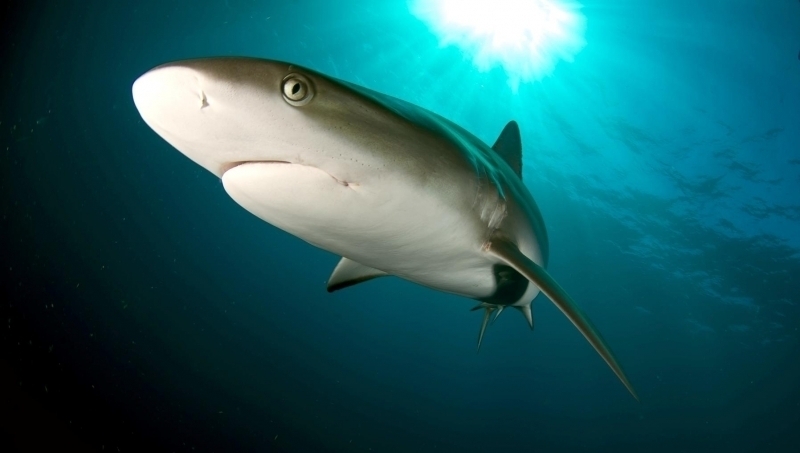 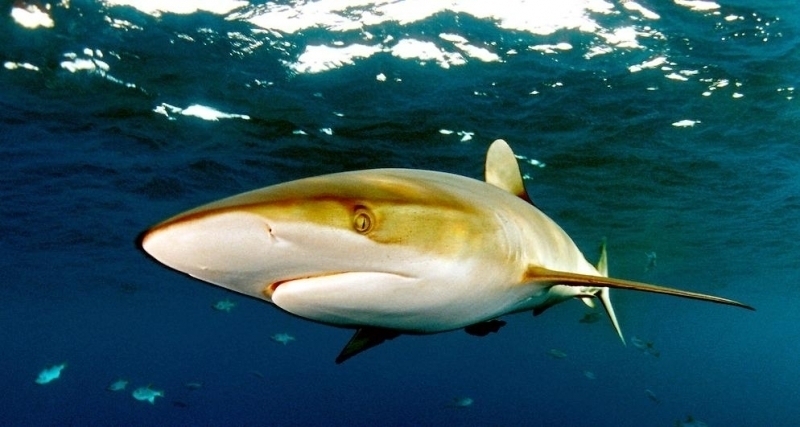 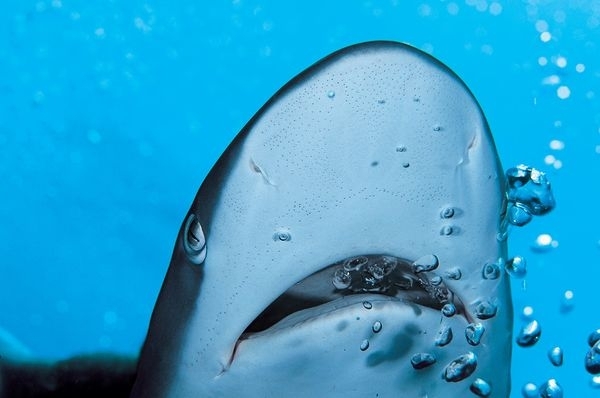 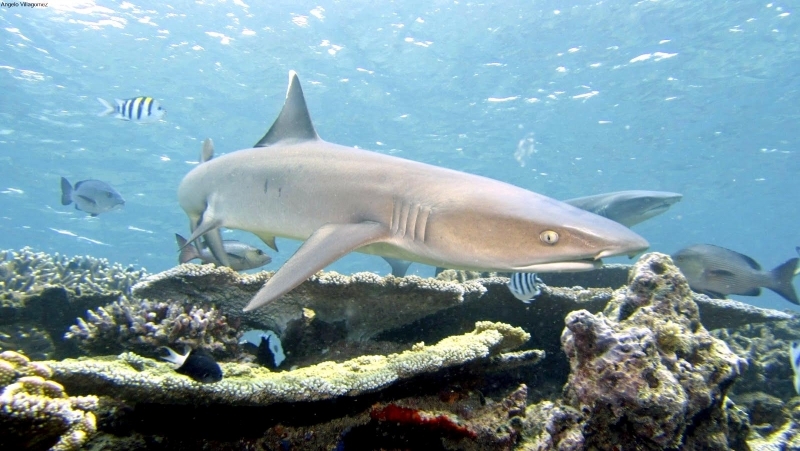 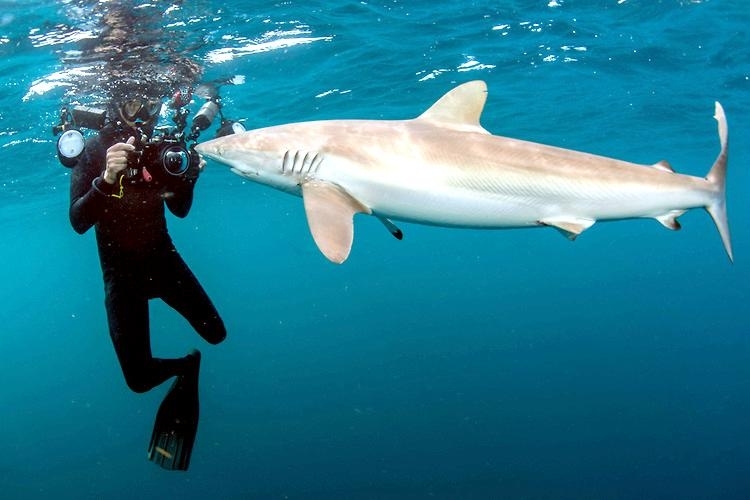 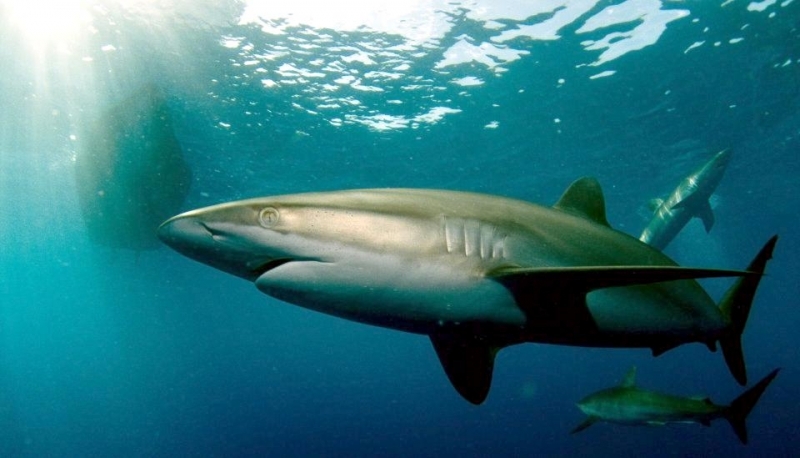 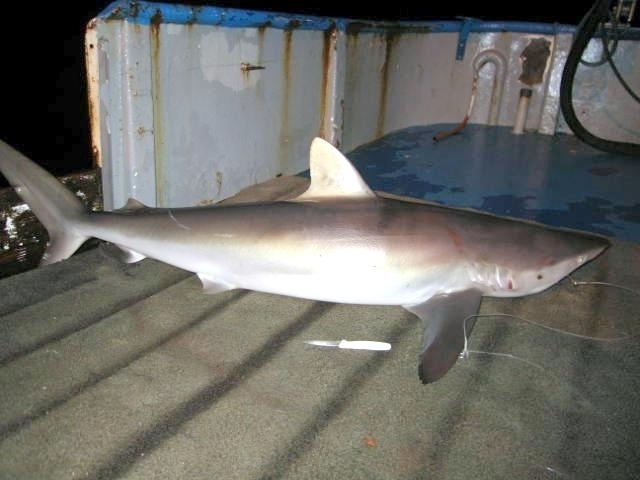 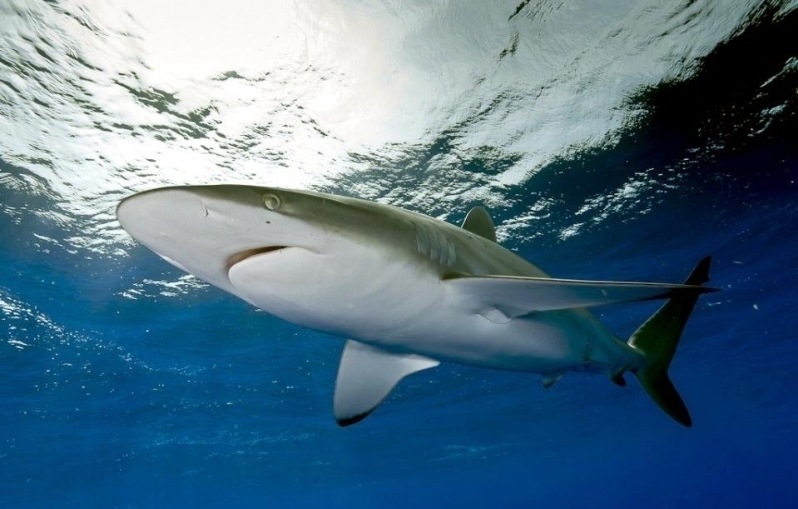 They feed primarily on fishes and various others including crabs have all been found in the stomachs of Silky Sharks. 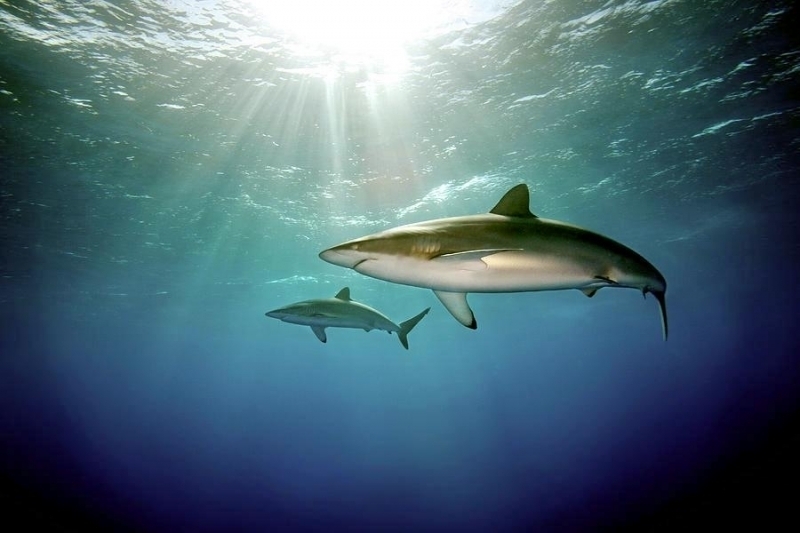 They are placental, meaning females give birth to live young. 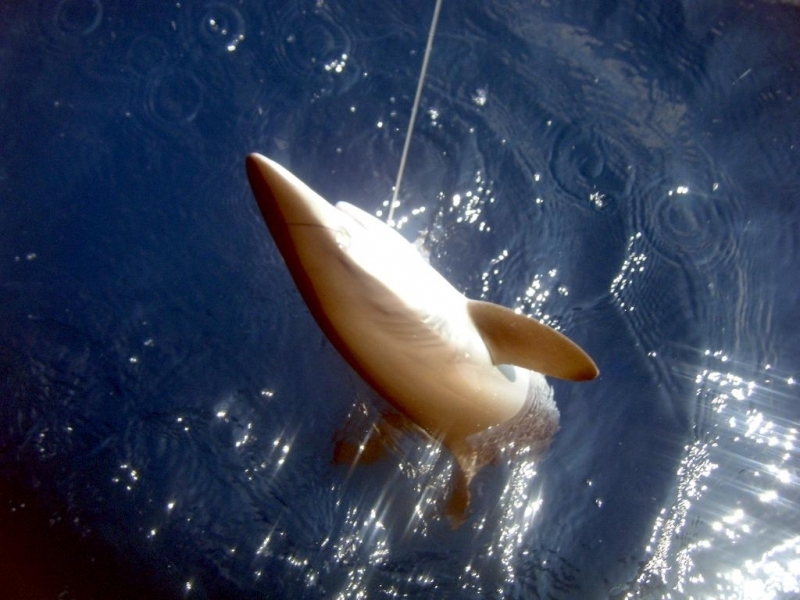 After about a 12 month gestation period, Silky Sharks usually produce between 2-14 pups per litter during late spring. 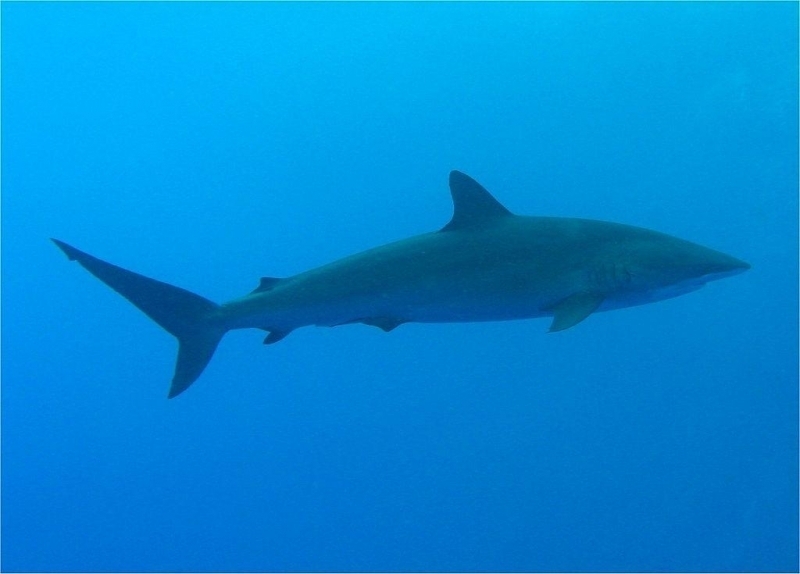 Pups measure between 73-87 centimeters and spend their first few months in shallow water near reefs before moving offshore into open ocean. 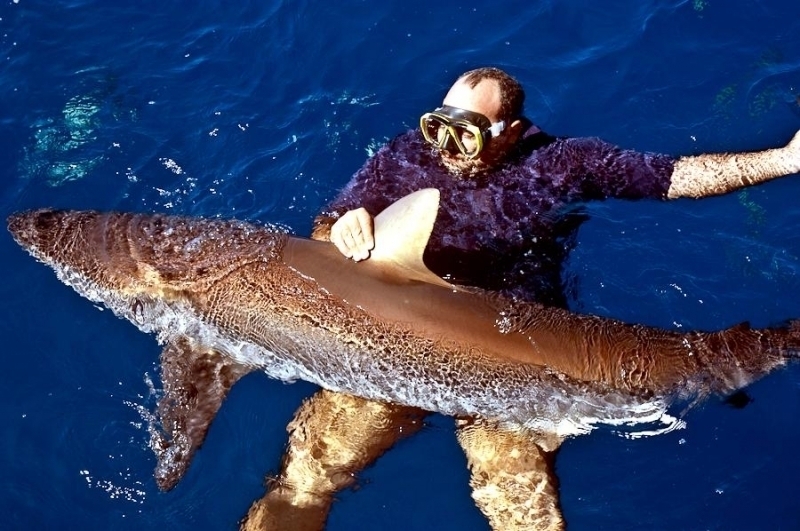 Silkies are considered dangerous to humans because of their aggressive nature & size. 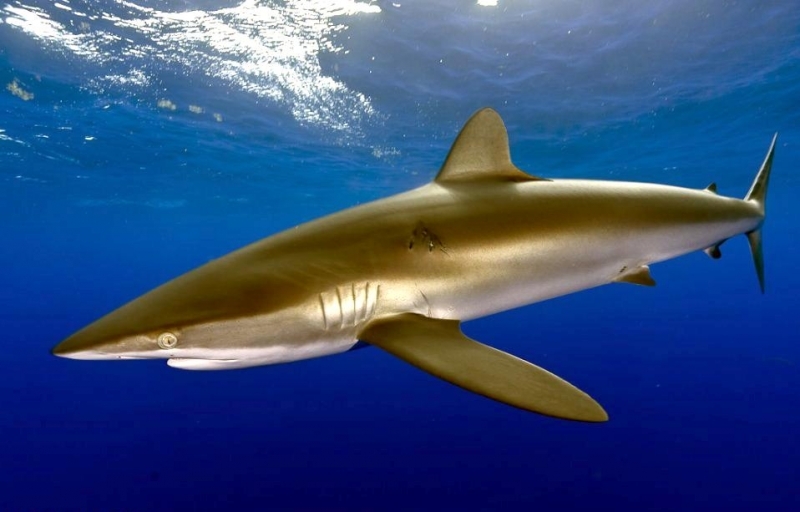 Silky Sharks have been observed with their head raised back arched and tail lowered, a posture believed to be a form of threat display.